The North Yungas Road (also Grove's Road, Coroico Road, Camino de las Yungas, El Camino de la Muerte, Road of Death, and Death Road) is a 61 to 69 km road (depending on source) leading from La Paz to Coroico, 56 km (35 miles) northeast of La Paz in the Yungas region of Bolivia. It is legendary for its extreme danger and in 1995 the Inter-American Development Bank christened it as the "world's most dangerous road". One estimate is that 200-300 travelers were killed yearly along the road. The road includes crosses marking many of the spots where such vehicles have fallen. A South Yungas Road (also Chulumani Road) exists that connects La Paz to Chulumani, 64 km (40 miles) east of La Paz, and is considered to be nearly as dangerous as the north road. Photographs of China's Guoliang Tunnel are often incorrectly identified as depicting Yungas Road. The road was built in the 1930s during the Chaco War by Paraguayan prisoners. It is one of the few routes that connects the Amazon rainforest region of northern Bolivia, or Yungas, to its capital city. Upon leaving La Paz, the road first ascends to around 5 km, before descending to 330 m (1079 ft), transiting quickly from cool altiplano terrain to rainforest as it winds through very steep hillsides and atop cliffs. Because of the extreme dropoffs of at least 600 meters (1,969 ft), single-lane width — most of the road no wider than 3.2 meters (10.5 ft) — and lack of guardrails, the road is extremely dangerous. Further still, rain and fog can make visibility precarious, the road surface muddy, and loosen rocks from the hillsides above. One of the local road rules specifies that the downhill driver never has the right of way and must move to the outer edge of the road. This forces fast vehicles to stop so that passing can be negotiated safely. Also, vehicles drive on the left, as opposed to the right like the rest of Bolivia. This gives the driver in a left-hand-drive vehicle a better view over their outside wheel, making passing safer. The danger of the road ironically made it a popular tourist destination starting in the 1990s, drawing some 25000 thrillseekers. Mountain biking enthusiasts, in particular, have made it a favorite destination for downhill biking, since there is a 64 kilometers (40 mi) stretch of continuous downhill riding. There are now several tour operators catering to this activity, providing information, guides, transportation, and equipment. 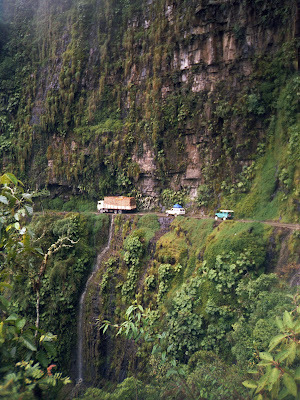 Nevertheless, the Yungas Road remains dangerous. At least 13 of these cyclists have been killed on the ride as of 2008. At the end of 2006, after 20 years of construction, a new road (a by-pass) from La Paz to Coroico was opened to public. This new route features modern construction (bridges, drainage, etc. ), multiple lanes, pavement, guardrails and many other elements that make it considerably safer than the original route. As a result, the original North Yungas Road is currently much less used by traffic, although an increasing number of adventure travelers bike it for the thrills. The new Yungas Road, as seen from Coroico. The Yungas Road, as it descends into the rain-forest. All text this post is available under the terms of the GNU Free Documentation License.